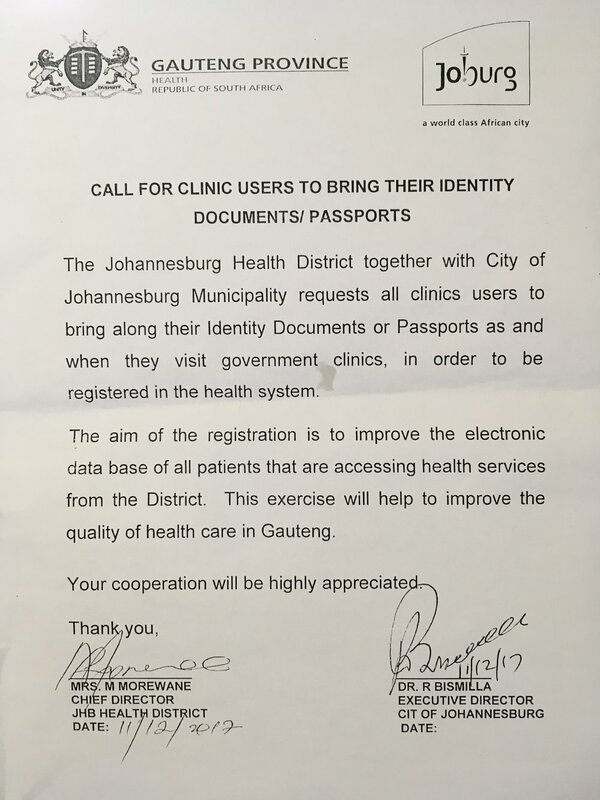 HIV+ patients without identification have been turned away at clinics when they don’t have ID documents. In Johannesburg many of the HIV+ mothers in support groups were in panic this week about defaulting on their treatment. They brought their complaints to the Family Africa (a local NGO) HIV counselling centre informing counsellors that they had been turned away at local clinics. One mother explained how after her husband was turned away at the clinic she decided to share her ARV’s with him so he would not get sick. This arrangement did not last too long as now they were both off treatment. Many foreign nationals went to the counsellors begging for ARV’s for themselves and their children. There is a need to upgrade the healthcare system in South Africa, yet in the interim there needs to be considerations on the potential impact this could have on HIV+ patients on treatment. This system has been implemented less than two months ago and we have already seen various patients falling off their treatment. Defaulting on HIV treatment not only has an impact on the patients themselves, putting them at risk of their health deteriorating, drug resistance and reinfection. It may also have a serious impact on pregnant women and the babies they are carrying who are more likely to be born positive if treatment stops during pregnancy. This new requirement therefore will also have a wider impact in the country with a greater burden on the healthcare system and the prevalence of HIV in South Africa through more people succumbing to illness as their immune system weakens and on the spread of HIV as the virus is more likely to be transmitted when individuals have stopped treatment. South Africa has made tremendous progress with access to treatment. If not done with caution this change in the healthcare system may put the country at risk of taking a step back in the progress made towards a AIDS free generation. Urgent action is needed by the department of health and the media to make clinic users aware of the new system. Showing clear steps to take for HIV+ patients to continue accessing treatment. Also taking special consideration for needs of children and youth on treatment as well as the sensitive case of foreign nationals. RIATT-ESA is the regional voice for children. It supports a joint, scaled-up drive towards universalaccess to prevention, treatment, care and support for children affected by HIV and AIDS in easternand southern Africa. RIATT-ESA is made up of civil society organisations, academia and regionalpolitical and economic bodies, and UN agencies.